We really enjoyed this delicious treat last Sunday and will be having it for the upcoming holidays and through the winter. The baby pumpkins were filled with chestnuts, apples, raisins and dried cranberries and served with a salty date caramel sauce. Next year, we will even grow extra baby pumpkins so we can enjoy this great treat more often. Carefully using a knife cut a circle around the stem of the pumpkin about 1/4-1/3 of the way away from the stem to remove the stem and a bit of the top portion of the pumpkin. Using a melon baller or spoon, scoop out the seeds and stringy parts. (I save he seeds to plant next year’s pumpkins). If your apples are organic, then cut them in small pieces, discarding the core and seeds. Otherwise, peel the apple and cut in small pieces. Place the apple pieces in a bowl. Cut the prepared chestnuts in small pieces and add to the apple pieces. Add the raisins and dried cranberries. Mix the sugar and cinnamon together, sprinkle over the fruit mixture and mix well. You will need about 2 cups of fruit mixture for the 4 small pumpkins, depending upon their size. Spoon the fruit mixture into each of the small pumpkins. Put a small dollop of vegan margarine on top of the fuit mixture so that as it melts it mixes with the fruit and pumpkin. Place the pumpkins in a baking dish that has a lid. Don’t forget to put the pumpkin tops in there also. Put the baking dish in the oven. Add the water to a level 1/3-1/2 way up the pumpkins and put the lid on the baking dish. Cook the pumpkins at around 415 F / 213 C for about an hour or until the pumpkins are soft and can be easily pierced with a sharp knife. When the pumpkins are done, carefully remove the baking dish from the oven. Using a slotted spoon or slotted utensil, carefully lift the pumpkins from the hot water and place on individual plates. Allow the pumpkins to slight cool before serving. 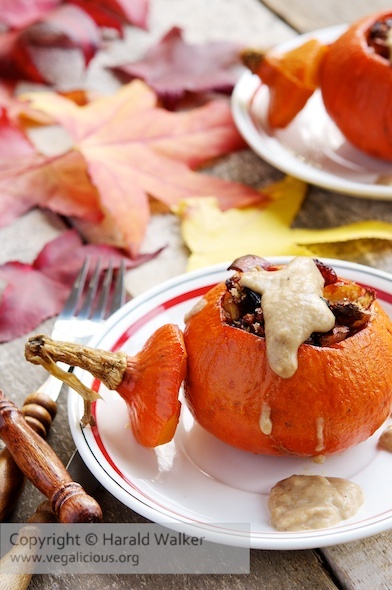 We enjoyed the pumpkins with the salty date caramel sauce on top. 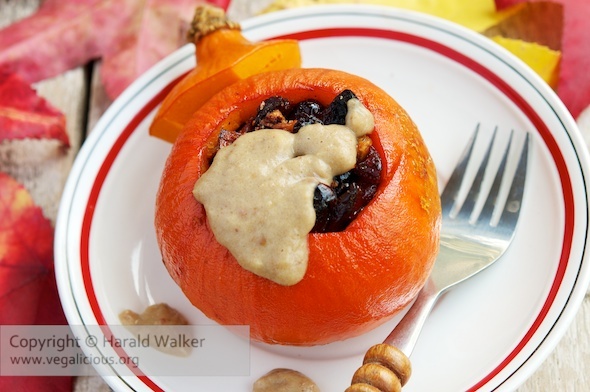 Posted by Chris Walker on November 7, 2011 in Apple, Cranberry, Desserts and Sweets, Pumpkin, Raisins.